It was only late in the month that I discovered that November 2017, was in fact an anniversary worth celebrating, so with friends we did just that, had a very nice meal out and drank a toast to it and looked forward to the next - so what was to celebrate? After 17 years as a centre lathe turner at a small engineering company in High Wycombe, Buckinghamshire, (England) I decided that I had had enough, gave in one weeks notice, and, as they say, jumped-out-of-the-frying-pan. That was in November 1967, from that moment on I called myself a ‘Freelance Model Engineer’, and decided to take on anything - and fifty years on I am still doing just that and have never regretted a day. All of my spare time for the several years previous, had been taken up with making models as a hobby. After a very modest wartime secondary education and no training in anything, I did seem to have an aptitude with tools and making things, it did not appear to matter what, my hands just had to make something. With no TV in those days, one either made something or kicked a ball around the streets - the latter never did appeal to me, and out door sport has never been a part of my life. Kits were all the rage, when kits consisted of a rough block of wood, a general arrangement drawing and a few instructions. That together with a razor blade, a pen knife, some sand paper, a pot or two of pant, and some imagination was all you needed - plus of course the inevitable tube of balsa cement - that was the time when you made models with it rather than sniffed it and go off your head. 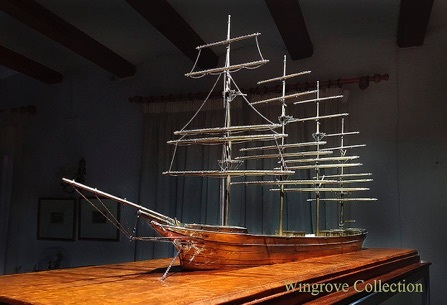 The start was a Keel Craft kit of the Golden Hind, and after completing several others including the the Cutty Sark, I had found my vocation. Then came the Underhill Plans among others and scratch building. I now felt that I was home and dry, but how to make a living from it? I noted in the Model Engineer magazine at this time an advert for a model maker, with a box number but no name or address. I sent in some photos of my model work and got a positive reply from the world famous Company ’Meccano’ in Liverpool, that was some 400 miles from my home. So at about 4.00 one cold morning I set off in my old Austin A40 and got there in time for lunch with some small examples of my work. They still seemed impressed and showed me a blue print for a Mercedes truck cab for a Dinky Toy, to be made as a set of patterns 10 X size, with + & - half a degree on the tapers, and asked “can you make this?” Having got this far, I said YES - so I became a professional Pattern Maker. I made the patterns and the Dinky Toy came into the shops, I felt very pleased with my progress, I had arrived. At about this time I had also written around to all corners of the UK that I could think of, who might need the services of a Model Engineer, and picked up odd - but interesting - jobs here and there, from jewellery to film props, dioramas and even a combine harvester, but ships were now my first love. I had built about half a dozen and sold several to private buyers. Then on the 2nd of August 1967 ‘Christies’ of London sold several of my models, including a 22 gun ‘Felucca’ , the Bengal Pilot Brig ‘Fame’ and the ‘SE5A’ aircraft models, all at reasonable prices. I had also met with (the late) Lord Montagu at about this time, who, impressed with a set of Duesenberg wheels and an engine that I had shown him, offered me the chance to build two model car collections for the Montagu Motor Museum, even though I had yet to build my first complete car model. So by that November I felt able to make the jump from shop floor to being my own boss. Later Lord Montagu commissioned the 25 square foot model of ‘Bucklers Hard’, and started plans for a model of the ‘Brooklands Motor Racing Circuit’. This on a scale of 1/400, which was the smallest I felt I could use and still make for recognisable cars and aircraft to be featured as part of the model, and even on that scale the model would be over 12 feet long, but it never got beyond the sample detail stage. However it was with the meeting of the owners of the classic cars, to collect data for the automobile miniatures for the M.M.M. Collection that things really took off. 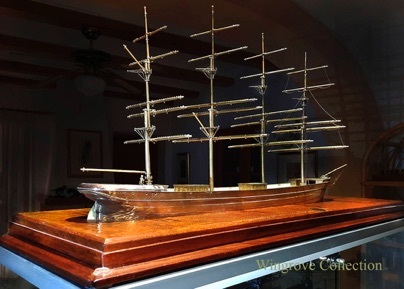 It is only now, 50 years on, and over 280 automobile models completed and in retirement, that I am able to return to my first love, the ship modelling, with the Falls of Clyde trio of models. With two completed and the third and final one now recognisable - see below - all-be-it with out the rigging, paint and much of the deck detail, but at least with all the sticks in place, I appear to have gone full circle The full coverage of this build will be shown here in due time - watch this space.